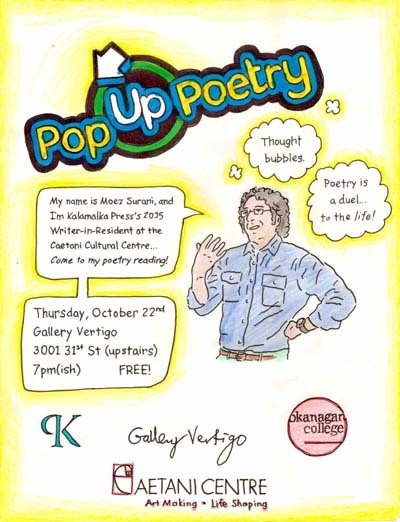 Don’t miss the Pop-up Poetry event with Moez Surani at Gallery Vertigo, Thursday, October 22, 2015. Doors open at 7pm – Bring a friend! 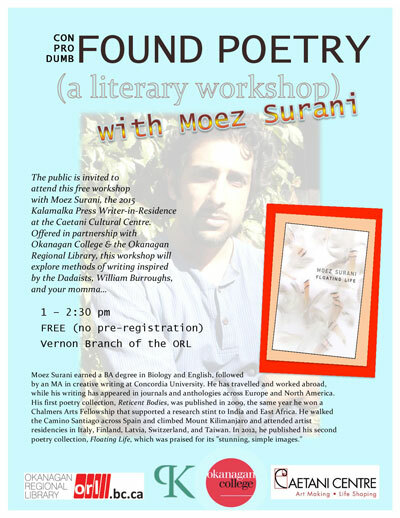 Don’t miss the reading by Moez Surani at Gallery Vertigo, Thursday, October 22. Doors open at 7pm – Bring a friend! 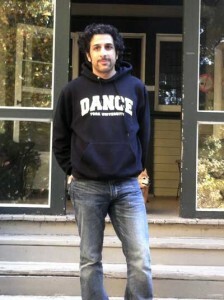 Moez Surani is a poet, reviewer and short fiction author. His writing has been included in numerous anthologies and literary journals, including The Literary Review of Canada and The Walrus. He has attended writing residencies in Finland, Latvia and Switzerland, and his writing has won the Chalmers Arts Fellowship, the Kingston Literary Award and the Antigonish Review’s Great Blue Heron Poetry Contest (see below). He lives in Toronto. “Moez is a youngish and accomplished artist-poet who works simultaneously and comfortably in multiple modes: the confessional lyric, the collaboratively performative, and the conceptually ostentatious. He has published two books of poetry with Wolsak & Wynn (with a third set to appear from BookThug in 2016), has acted with the Elephants Collective, and has attended several writer residencies in Taiwan, Latvia, Switzerland, and all over the heck of the world. Kevin McPherson met Moez Surani on a 9-day journey by boat across Southern Ontario reading poems to people on the 2012 Fish Quill Poetry Canoe tour. It was inspiring and inspired! This year, the residency has moved from the Mackie Lake House to the more central location of the Caetani Cultural Centre near downtown Vernon. Also, the length of the residency has expanded from two weeks to the entire month of October! Moez will give at least one public reading/performance in the North Okanagan; details to come soon. In the meantime, I urge/welcome you to contact him to arrange a classroom visit. I have read, traveled, and collaborated with Moez and can haply vouch for his contagious enthusiasm and breadth of knowledge/experience/passion. When a poet speaks of having been “given” a line, often the poem’s first line that sets the form, pace and sounds of the rest of the poem, then he or she may be hearing poetry at its origin, not as an idea, not as a mood. The judges decided that the first prize winner, “Are the Rivers in Your Poems Real,” by Moez Surani is such a poem. It shows a fearless trust in the lyrical. It never abates its space. One judge commented: “The speaker’s insistent questioning is mirrored by the poem’s form rolling forward with confidence, sustaining its energy throughout, allowing its impulse the room to develop, deepen and reset its course.” There are, however, persistent ambiguities in the poem preventing it from being too rhetorical. There are switches of address and reference from “rivers” to “this river,” from “they” to “it,” from “you” to “I,” from western cultural experience to eastern, from the whole body of human poetic experience to the particular poetic experience of the speaker. Whether the speaker’s river is confluent with all other rivers, or whether those rivers are confluent with the speaker’s river may seem only two different ways of asking the same question. But the poem refuses to say yes to either. By doing so it dramatizes the tension between the world of the collective myth and poetic imagination on the one hand and individual experience and empirical decision on the other.